I purchased all my parts at Futurlec (Other than the sensor) I find these guys very good on variety and price. Sensors in Australia start around $150, and can be as high as $220. I found Oxycheq have a Teledyne R-17, for US$80, with postage it cost me AU$93.40. I have found AquiferTec has PSR-11-39-JD1 for $120 delivered. I have tested this and works fine. Oxycheq even have a DIY EL Cheapo II Kit for US$110. By the look of the parts it looks very similar to the below. with postage it would cost about AU$130. This is connected to R2 (30kΩ). See picture top left quadrant of the picture (Labelled 3002, its a surface mounted resistor). Its easy to find the pins of the controller chip. The chip is the blob in the middle of the board, the pins are in a standard 40 pin arrangement around it. Count from bottom left pin1, to bottom right pin 20, top right pin 21, top left pin 40. To connect the sensor to the panel you have to build a small calibration circuit. This is done using 1 x 100kΩ, 1 x 27kΩ resistors, and a 10kΩ Pot, configured as such. 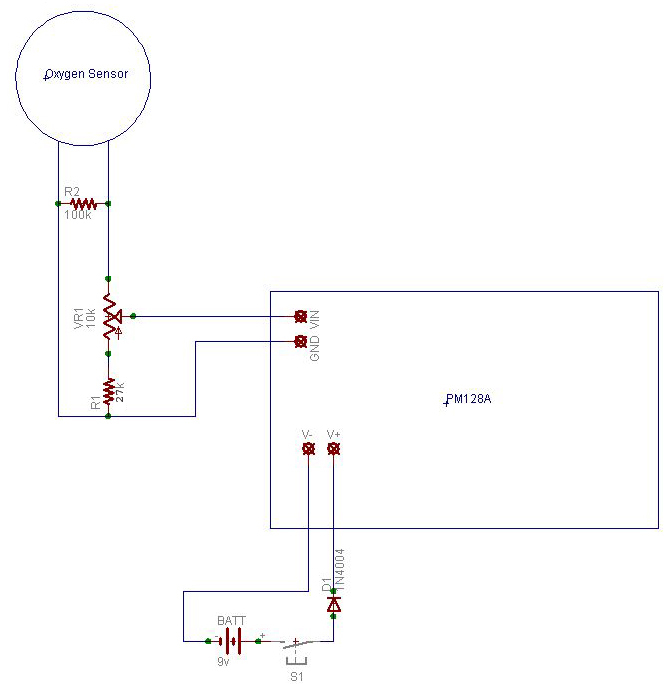 A 9v battery is connected via a switch and a diode to the V+ V- on the panel. I put this diode in series to prevent a battery reversal from causing damage. Stupidly, not wearing glasses, I tried to put a new battery on and touched the wrong terminals. The panel is suppose to handle a battery reversal for a short period, but how do you define short. 2 to 3 seconds was to long....New panel required. 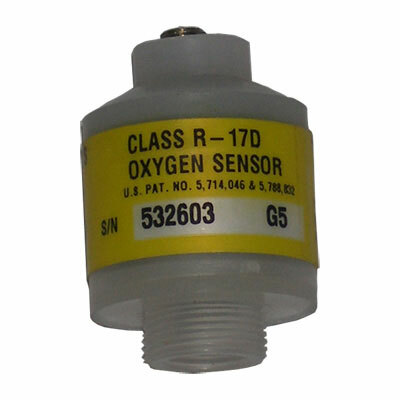 The sensor I used from Oxycheq has a normal reading for air between 7-11mV. (Nominally 10.45mV) This way with the above modifications the meter will read 20.9 for air. Each 1% of oxygen increases the voltage of the sensor by 0.5mV. or 1% on the modified meter. Once the build is complete you have to calibrate the unit. When a new sensor is used, re-calibration may be required, also as the sensor ages, the output voltage drops, again re-calibration may be required. 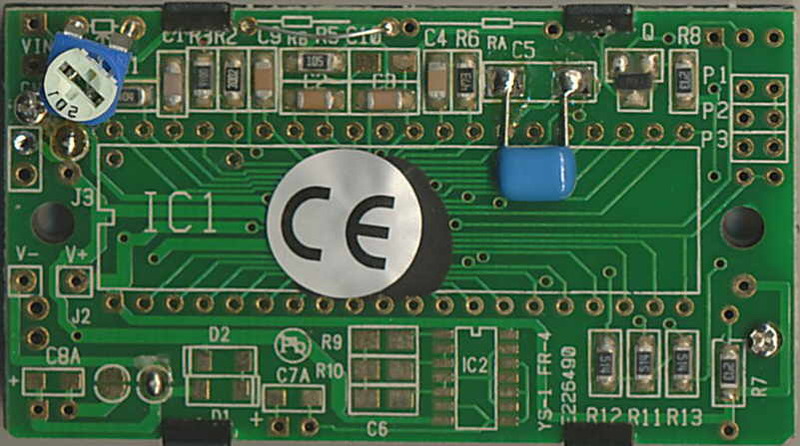 Mk2 has a diode mounted on the switch between the switch and the board. Mk3 added the multi turn trim pot.